Coffee with the Principal—the dog didn’t eat your homework. Our first Coffee with the Principal for the year was held Friday, October 12, in the OFE library. We were excited to have a large turnout to hear OFE administration and teachers discuss the school’s homework policy and objectives. The discussion was led by Principal Andrew Casler and Teacher Specialist David Church. The meeting was kicked off with an explanation that the OFE administration spent considerable time over the summer discussing what homework at OFE should look like, and the school has come out with homework guidelines by grade level. Mr. Church then shared these guidelines with parents. The guidelines may be found in the OFE handbook, and have also been included at the end of this article for easy reference. The intent of these guidelines is to standardize the amount of homework given to students within grade levels. As explained by Mr. Church, homework is intended to enforce a literary component across all grade levels, provide meaningful extension learning, apply what you’re learning at school to real life and allow for a response to intervention. 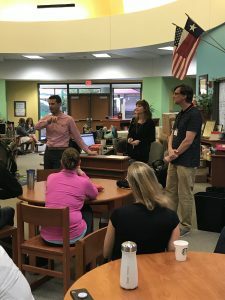 Teachers from Kindergarten and Fifth Grade were then given the opportunity to explain in detail what homework looks like at each of those grade levels. Ms. Rodriguez went through the monthly Kindergarten homework “menus” that give students options for which homework to choose. She also explained that time should be spent on their reading component chart and sight word lists. While Kindergartners are not required to know all sight words to progress to first grade, she did explain that first graders are required to master a list of 125 sight words for promotion to second grade. Starting to learn these words in Kindergarten makes that process easier in first grade. Finally, there is a monthly project for those in Kindergarten. Mr. Warren and Ms. Woodfin then talked through what homework looks like for those in fifth grade. Ms. Woodfin covered the math/science component of homework. She explained that there are three online resources available for fifth grade students to use – IXL, Imagine Math and Reasoning Mind. Students in fifth grade should be going online three times per week to use these platforms to practice their skills. Each session takes approximately 20 minutes. She also mentioned that classwork that was not completed within classroom time may be sent home to be completed at home. Ms. Woodfin emphasized that at this grade level students should be building more independence with regards to managing their homework, and students should be using planners to plan out their work and schedules for the week. Mr. Warren then spoke about the literary component of fifth grade homework. He explained that students should be reading at home four times per week, and students may also use that time to write instead of read to meet that requirement. 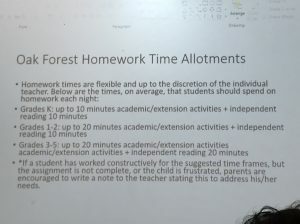 Mr. Warren also emphasized, like Ms. Woodfin did, the need at this level for students to learn to make time for their homework outside of school. The session was then open to questions from parents. One parent commented that when they were a child, homework was their responsibility, and asked what the expectation is for parents/students with regards to homework at OFE. It was explained that in the earlier grades parents should help students become engaged with homework and get them into the routine of doing it at home. Then in grades third through fifth, the goal is to make students more independent and able to manage workload on their own. Administration ended the session with letting parents know that if their child’s homework is consistently taking more time than those amounts recommended per policy, that parents should reach out to their student’s teachers to let them know that the actual time required at home for completion of homework is taking much longer. Overall it was an extremely informative session, and we are all grateful that the administration and teachers have taken the time to put thoughtful policy in place and explain it to parents. Thank you to all administration and teachers for your time Friday morning! * If a student has worked constructively for the suggested time-frames, but the assignment is not complete, or the child is frustrated, parents are encouraged to write a note to the teacher stating this to address his/her needs. By Jennifer Kruppa and Beth Caldwell.